Three Indian tribes that the French interacted with on the May River provide further evidence that the Altamaha River in Georgia, not the St. John’s River in Florida, was one-in-the-same as the May. These villages were Utina, Patica, and Alecamani. All are shown on maps dating back to at least 1591 as being on the same river system as French Fort Caroline. Only the state of Georgia is known to have had three such tribes living in close proximity to one another. But this begs the question: if the Utina lived upriver from Fort Caroline and the fort was supposedly on the St. John’s River in Florida why would the Spanish have built a mission for the Utina on the Altamaha River in Georgia? This suggests the fort was on the same river as the mission: the Altamaha River. This evidence reveals that Bartram was describing Georgia tribes living along Georgia rivers. He next lists Yamasees, another known Georgia tribe, and the Utinas, likely one-in-the-same as Utinahica. (Hica means “village”[vii] thus Utinahica simply means Utina village.) It stands to reason that Bartram’s Utina also lived in Georgia as did the last two tribes, Icosans, and Paticos. The 1591 map Floridae Americae Provinciae Recens[x] by Jacques Le Moyne, Fort Caroline’s resident artist, was the first to show these locations in association with the fort. 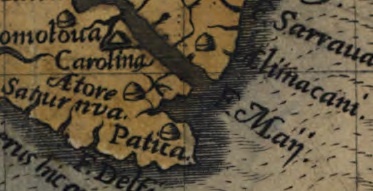 Detail from 1591 map showing Carolina (Fort Caroline) and Patica. 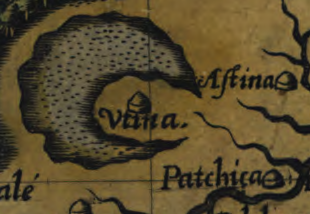 In addition to the coastal Patica, Le Moyne’s map also shows the Utina living up the May River inside a crescent-shaped lake near a tribe called the Patchica (Pati-hica? ), again likely associated with Laudonniere’s Patica and Bartram’s Paticos. 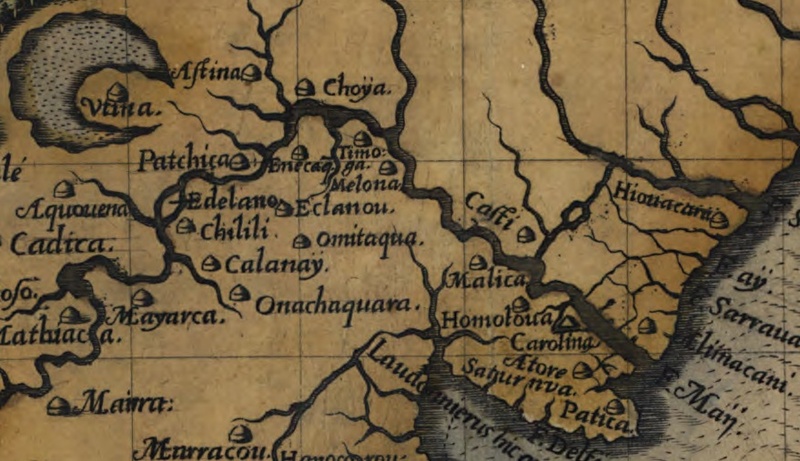 The 1625 map Florida et Regions Vicinae shows the Utina living up the River of May near the Patiqua, likely one-in-the-same as Bartram’s Paticos and Laudonniere’s Patica. 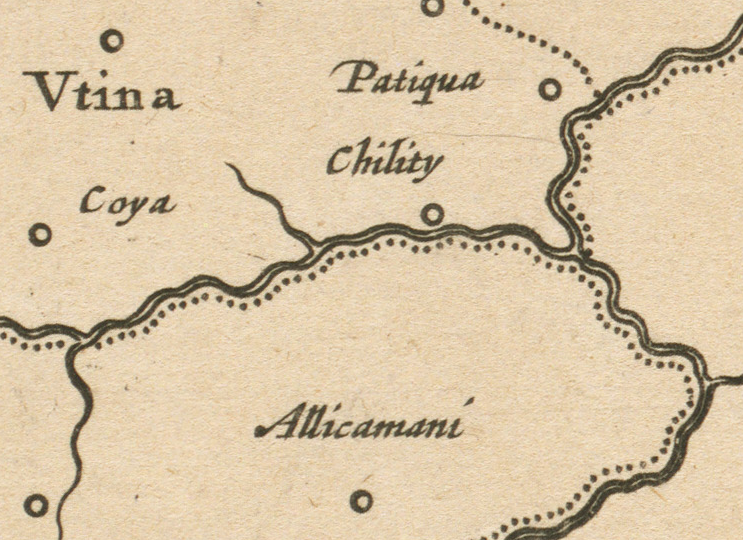 1625 map shows Utina near Patiqua and upriver from Allicamani. William Bartram recorded two such tribes, the Utina and Patico, living in Georgia. This supports the hypothesis that the Altamaha River in Georgia was the May River, the site of Fort Caroline. Is there enough evidence to try and find the actual location where the Utina lived? The 1625 map and the 1591 Le Moyne map both show the Utina living upriver from the Allicamani and located not on the river but some distance inland from the river beyond a fork in the river. Le Moyne’s map showed that Utina was located in the center of a crescent-shaped lake. Are there any crescent-shaped lakes 13.1 miles from Doctortown? In fact there are. 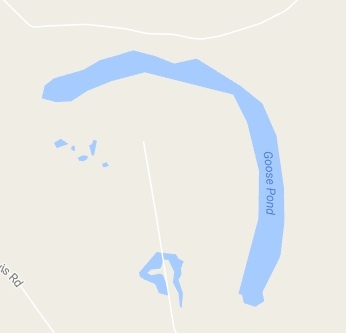 Twelve and a half miles north east of this location between Ludowici and Allenhurst is a crescent-shaped lake called Goose Pond (although satellite views show this lake has almost dried up today.) This is very close to the Spanish estimate of 13.1 miles. Could this lake be the one Le Moyne drew on his maps as the location of the Utina? Goose Pond is also only 16 miles from Sansavilla Bluff, a possible location of the Santa Isabel de Utinahica mission. If one were to build a mission to the Utina it would make sense to do so relatively close to their main town. The Sansavilla Bluff site fits the bill. Map showing two possible Utina locations in relationship to Doctortown and Sansavilla Bluff. Click on tabs & blue/green lines for information and zoom in to see details. Also near Sansavilla Bluff are the modern place names of Aleck Island, Alex Creek (Aleck Creek? ), and Doctor Creek (Aleck Creek?). Interestingly, the 1625 map shows Utina located just upriver from a town called Alecamani. It also shows it located after a fork or branch of the main river channel. Doctor Creek does branch off here from the Altamaha and is a substantial creek system. Satellite view of pond on Fort Stewart military base that matches Le Moyne’s map illustration. 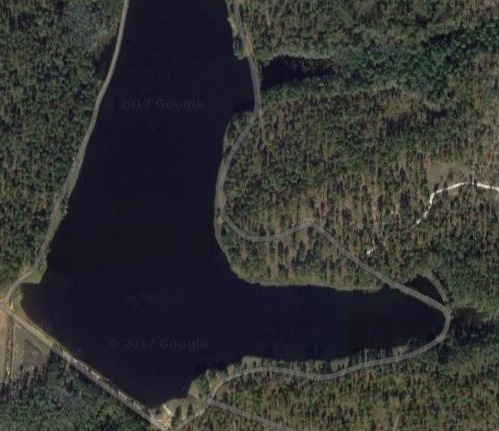 Although this site appears to fit Menendez’s travel itinerary the best another possibility exists nineteen miles north of this location where lies another crescent-shaped lake northeast of Glennville on the Fort Stewart Military Reservation. This distance is somewhat greater than the 13.1 miles the Spanish claimed but if one travels upriver several more miles and disembarks it is precisely 13.7 miles to the center of the crescent-shaped lake. This lake has not dried up and is still visible from satellite images. And it is the exact shape and orientation of the crescent-shaped lake on Le Moyne’s map. Unfortunately, no archaeological work has ever been done at either of these two locations to determine if an Indian village was located there. In the Spring of 2014 I participated with the Fort Caroline Archaeology Project in scouting a potential Utina site west of Glennville, Georgia. TFCAP’s archaeologist did shovel tests at the site but the results were negative. Neither of the two sites listed above were tested at that time. Le Moyne’s 1591 map shows Alecamany (curiously misspelled Alimacani like the Spanish) at the mouth of the May River on the north side. Other maps such as the 1625 Florida et Regions Vicinae show the Alecamani upriver from the mouth and downriver from the Utina just before the first fork of the May River. The first major fork in the Altamaha upriver from Fort Caroline is at Doctor’s Creek (Aleck Creek?). Doctor’s Creek is a substantial creek system with two of its branches coming within two miles of the crescent-shaped lake I believe has the strongest possibility of being the location of Utina. Five miles downriver from Doctor’s Creek is Alex Creek (Aleck Creek?) Seven miles further downriver is Sansavilla Bluff where the abundance of Spanish artifacts were found as well as evidence of a longstanding Native American settlement. An additional eight miles downriver is an island named Aleck Island. (Aleck Island is located just 14 miles upstream from my proposed site for Fort Caroline.) These Aleck place names are situated in the same area where the 1625 map places Alecamani. The Muskogean aleck or “doctor” was the most prominent placename on the lower section of the Altamaha River. Both the name of a major trading path, the Alachua Trail, and rival tribe, Alecamani, seem to point travelers to this location. According to researchers, “The Alachua Trail, a north-south route for Indians and other travelers, was well known in the colonial period of America, a fact pointing to long aboriginal use. It started at the Altamaha River in Georgia and continued to the Alachua Lands around Micanopy, Florida.”[xvi] William Bartram traveled this trail and said it went as far north as Virginia. So what was so valuable at Aleck Town that Native Americans would travel so far to get? So not only does this provide further evidence that the Altamaha was the location of Fort Caroline but it also explains why Aleck was such a prominent place name. Fevertree bark was a powerful medicine that could save lives and it only grew in a limited area of South Georgia including at Aleck Town (Doctor Town.) This explains why both a major trading path, the Alachua Trail, and neighboring Indian province, Alecamani, were directing travelers to this location. Two of the tribes the French reported living near Fort Caroline, the Patica and Utina, were said to live in Georgia by William Bartram. 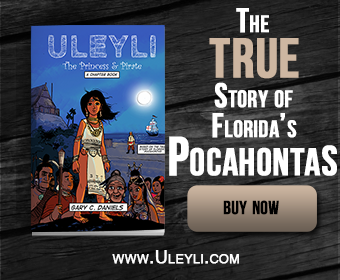 No independent accounts of these tribes living on the St. John’s River have ever been made. The placename aleck which was part of the name of another tribe recorded near Fort Caroline, has an extensive history on the Altamaha River but none on the St. John’s River. And the medicinal plant that’s the raison detre for this placename, the Georgia bark or fevertree, grows on the Altamaha but not the St. John’s. It seems clear that the Patica, Alecamani and Utina were situated on the Altamaha River in the exact same locations where French maps placed them on the May River. This provides more evidence that the Altamaha and River of May are one-in-the-same. [i] “Utinahica.” Wikipedia.org. Accessed online 16 May 2014 at < http://en.wikipedia.org/wiki/Utinahica>. [ii] “The Santa Isabel de Utinahica Project.” FernbankMuseum.org. Accessed online 16 May 2014 at < http://www.fernbankmuseum.org/research-collections/the-santa-isabel-de-utinahica-project/>. [iii] Elliot, Dan. “Sansavilla Bluf: Survey at the Crossroads of the Colonial Georgia Frontier.” LAMAR Institute. Accessed online 13 January 2017 at < http://www.thelamarinstitute.org/images/PDFs/publication_63.pdf>. [iv] Worth, John. “The Early 17th Century Locations of Tama and Utinahica.” Historic Indian Period Archaeology of the Georgia Coastal Plain. University of Georgia, p. A-5. Accessed online 13 January 2017 at < http://uwf.edu/jworth/Worth%201994_Tama.pdf>. [v] Bartram, William. “Settlements and Migrations of the Muscogulges.” in Hernando de Soto and Florida. Edited by Barnard Shipp, Philadelphia. 1881: p.642. [vi] Daniels, Gary C. “Dakota Sioux Once Lived in Georgia?” LostWorlds.org. Accessed online 13 January 2017 at < http://lostworlds.org/dakota-sioux-lived-georgia/>. [viii] Laudonniere, Rene. Three Voyages. p.76. [ix] Laudonniere, Rene. Three Voyages. pp. 102-103. [x] Le Moyne, Jacques. Floridae Americae Provinciae Recens & exactissima descriptio Auctore Iacobo le Moyne cui cognomen de Morgues, Qui Laudonnierum. Frankfurt, 1591. Accessed online 13 January 2017 at < https://www.raremaps.com/gallery/detail/44426/Floridae_Americae_Provinciae_Recens_and_exactissima_descriptio_Auctore_Iacobo/Le%20Moyne.html>. [xi] Barrientos, Bartolome. Pedro Menendez de Aviles: Founder of Florida. p.115. [xii] “Altamaha River State Canoe Guide.” AltamahaRiver.org. Accessed online 16 May 2014 at < http://www.altamahariver.org/map2012.pdf>. [xiii] Laudonniere, Rene. Three Voyages. p.89. [xv] Daniels, Gary C. “Dakota Sioux Once Lived in Georgia?” LostWorlds.org. Accessed online 13 January 2017 at < http://lostworlds.org/dakota-sioux-lived-georgia/>. [xvi] “Alachua Trail.” KingsleyLake.org. Accessed online 13 January 2017 at <http://www.kingsleylake.org/facts/history/AlachuaTrail.html>. [xvii] Daniels, Gary C. “Bartram’s Fevertree Helps Pinpoint Fort Caroline Location?” TheNewWorld.us. Accessed online 13 January 2017 at <https://thenewworld.us/bartrams-fevertree-helps-pinpoint-fort-caroline-location/>. Bartram’s Fevertree Helps Pinpoint Fort Caroline Location?